There I was, at the age of 38, married with two children, asking my sister to help me bribe my parents. In exchange for contributing to my private singing lessons for a year at my sister’s performing arts school, my sister and I would sing a duet at the school’s year-end show. That way, I had something to offer my folks in exchange for the several hundred dollars I was about to request. It worked, but I don’t know if the bribe had much to do with it. I think my parents understood that this was more than just fun for me. For the past 15 years I’ve been on a journey, repairing the errors I made in my teens. After finally learning to say no, speak my truth and practise self-discipline to help me reach my goals, freeing my voice was next on the list. Having an imprisoned voice is like an illness. The symptoms include mumbling – especially the puzzling kind where you start talking at a normal volume, then get faster but quieter as you go. You suffer from a feeling that you don’t count, and you’re frustrated with the dichotomy of the whole situation – you want to say something, you want people to hear it, but you don’t want to say it and you don’t want people to hear it. 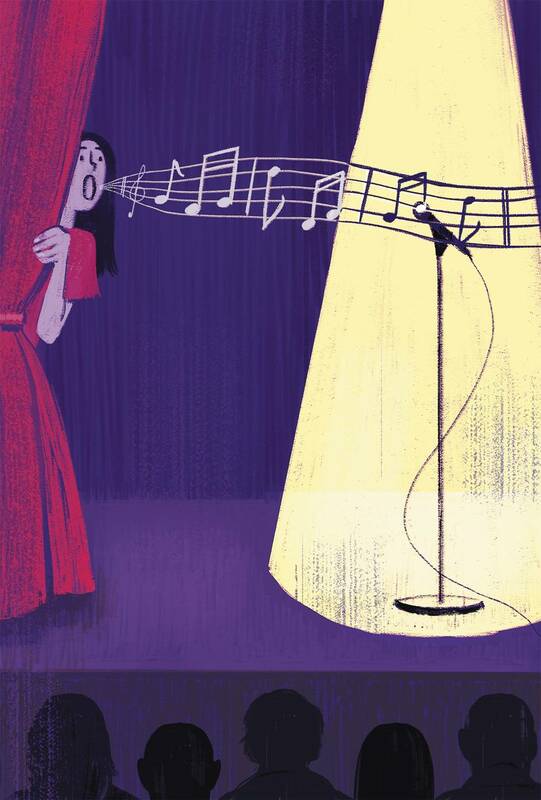 The most direct way to release my voice from its prison and allow it the expression it had so long been craving was to enroll in private voice lessons and sing at the accompanying recitals. I am not scared of being on stage, but I’m scared of how my singing voice sounds. Everyone cringes at unpleasant sounds: fork prongs on ceramic plates, fingernails on chalk boards, train brakes – I didn’t want to be on that list. So I set myself a goal: to sing in front of a crowd without feeling embarrassed. Several times a week, I squeezed 45-minute practice sessions into my already heavily booked days. Ten weeks later, I had my first recital. For 15 years, I had competed in tap and jazz dance. When waiting backstage, I preferred to ignore competitors ahead of me to help calm my nerves, but at this recital I had to sit in the audience and watch. Though I was only the third singer on the program, listening to the first two made me incredibly nervous. The first song was The Fight Song by Rachel Platten. It was all the more powerful because the tiny voice singing it belonged to a girl who couldn’t have been older than 7. Yes, a seven-year-old intimidated me. The next singer up was a little older, perhaps nine or 10, and sang Part of Your World from The Little Mermaid. Wearing a green sequinned dress, she actually resembled Ariel. While I was admiring her courage, I discovered a new problem: I had suddenly forgotten my lyrics. Unexpected Song by Andrew Lloyd Webber had unexpectedly left the building. The longer I listened to Part of Your World, the more scared I was that those lyrics would scroll through my head like operatic surtitles – instead of the ones I’d been practising almost daily for the past 10 weeks: “I have never felt like this. For once I’m lost for words; your smile has really … ” Oh-oh. Shown? No, thrown. “Your smile has really thrown me … ” Oh shoot, what comes next? The lyrics, thankfully, jumped back into my head by the time I reached the microphone. But I felt as if every organ and cell had evacuated my chest cavity to make room for my thumping heart. As my heart pounded against my vocal cords, anything I’d learned about supporting my sound escaped. Lower notes need only a little breath support, so those sounded okay. The higher ones need a lot more, and they started to waver. But as the song played on, I reminded myself there was nothing to be done. It may have been only my sister’s studio, but in a small way I was achieving my goal: singing in front of an audience without feeling embarrassed. And then came the last note, a sustained high G. As I led up to it, a surge of energy came through my groin, ran up my torso and turned my spine into an iron rod. My abdominal and oblique muscles hardened and – out the note came, on key, loud and clear. I don’t think I squeaked even as I closed it. I got the same huge round of applause the younger artists had received, 100 people in the room cheering for me. It felt incredible. When I sat down, my sister smiled and pointed to the tears in her eyes. She knew what this journey meant for me. I’ve set myself a new goal: to sustain my breath support while singing in my soprano range. No wavering. And I couldn’t forget my promise to my parents: to sing a duet with my sister. So, on Saturday, June 4, I’ll be living two dreams: fearlessly singing in my soprano range (even if I do sound like fingernails on a chalk board) and performing a duet with my sister. Then I’ll have to think of a new bribe for my parents so I can set myself bigger goals next year. Lori Straus lives in Waterloo, Ont.